Here is a look at some books coming your way in 2018! Simply put, "sisyphean" means a task that can never be completed. Based off the synopsis, Sisyphean sounds like a horrifying story that many people will find eerily familiar. I am very much looking forward to giving this one a read! I haven't read anything by Myke Cole...yet, but I am eager to give The Armored Saint a read. The book popped up as an advanced recommendation, and the cover grabbed me. I gave the synopsis a read and you could say that my interest is officially peaked! This book drops February 20th! Shipp is one of those authors I have heard a lot about, but never read. 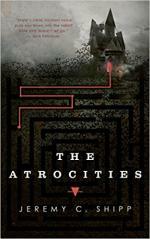 The Atrocities tells the story of a young ghost's education - post death. Any story that starts after a person's death has my attention. When Isabella died, her parents were determined to ensure her education wouldn’t suffer. But Isabella’s parents had not informed her new governess of Isabella’s... condition, and when Ms Valdez arrives at the estate, having forced herself through a surreal nightmare maze of twisted human-like statues, she discovers that there is no girl to tutor. Serpent in the Heather by Kay Kenyon. Kay Kenyon is another author I haven't read before, but 2018 is the year I branch out both into new genres and to new authors. I am a huge fan of WWII, post, and Cold War era stories, especially when they introduce some paranormal and fantasy elements into the mix. Serpent in the Heather looks to be a worthy read for anyone who enjoys The Man in the High Castle, or Quentin Tarentino's Inglorious Bastards. Now officially working for the Secret Intelligence Service, Kim Tavistock is back to solve another mystery—this time a serial killer with deep Nazi ties—in the sequel to At the Table of Wolves. The Cabin at the End of the World by Paul Tremblay. I really enjoyed A Head Full of Ghosts, and The Cabin at the End of the World sounds no less gripping and suspenseful! Tremblay masterfully sets theme and tone, building suspense organically, and thus, pulling you fully into the story and conflict. I can't wait for this one! The Bram Stoker Award-winning author of A Head Full of Ghosts adds an inventive twist to the home invasion horror story in a heart-palpitating novel of psychological suspense that recalls Stephen King’s Misery, Ruth Ware’s In a Dark, Dark Wood, and Jack Ketchum’s cult hit The Girl Next Door. Persepolis Rising by James S.A. Corey. I am a huge fan of Corey's Expanse series. These books have become regular adds through Audible and make the commute that much easier to tolerate. The Expanse novels are one of those series that allow its characters to really drive the story. James Holden and his crew aboard the "acquired" frigate Rocinante are more than capable of carrying the entire series on their own, but as the universe expands and the conflicts grows, the series just gets that much more compelling. The show on Syfy is a very well made adaptation, and stays faithful to the books, but for my money, I will devour every book in this series as soon as they come out!